There are more than 500 neighborhoods within Jacksonville’s vast area. 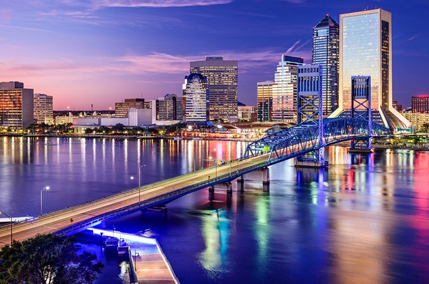 These include Downtown Jacksonville and its surrounding neighborhoods, including LaVilla, Brooklyn, Riverside and Avondale, Springfield, Eastside, and San Marco. The city’s location on the St. Johns River and the Atlantic Ocean proved providential in the growth of the city and its industry. The Florida Theatre, opened in 1927, is located in downtown Jacksonville and is one of only four remaining high-style movie palaces built in Florida during the Mediterranean Revival architectural boom of the 1920s. A number of cultural events are also held in Jacksonville. The Jacksonville Jazz Festival, held downtown, is the second-largest jazz festival in the nation, while Springing the Blues, one of the oldest and largest blues festivals, has been held in Jacksonville Beach since 1990. The city center includes the Jacksonville Landing and the Jacksonville Riverwalks. The Landing is a popular riverfront dining and shopping venue, accessible by River Taxi from the Southbank Riverwalk. Jacksonville operates the largest urban park system in the United States, providing facilities and services at more than 337 locations on more than 80,000 acres (320 km2) located throughout the city. Jacksonville enjoys natural beauty from the St. Johns River and Atlantic Ocean. Many parks provide access for people to boat, swim, fish, sail, jetski, surf and waterski. Several parks around the city have received international recognition. The city is home to a number of institutions of higher education.